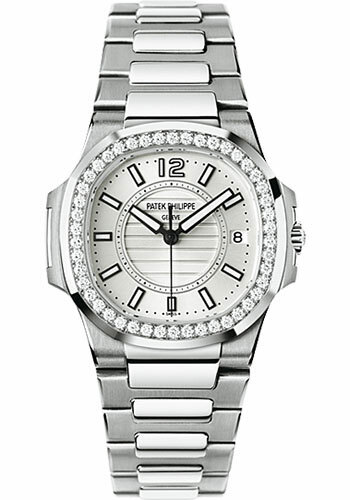 32mm 18K white gold case set with 46 diamonds (~0.73 ct.), charcoal grey dial with gold applied hour markers with luminescent coating, quartz caliber E 23-250 S C movement with date and center sweep second hand, 18K white gold bracelet Nautilus fold-over clasp. Water resistant to 60 meters. 32 mm 18K white gold case set with 46 diamonds (~0.73 ct.), charcoal gray dial with gold applied numerals and luminescent hour markers, caliber E23-250 S C quartz movement with date and sweep seconds, 18K white gold bracelet, Nautilus fold-over buckle. Water resistant to 60 m.
32mm 18K white gold case set with 46 diamonds (~0.73 ct.), silvery white dial with gold applied hour markers with luminescent coating, quartz caliber E 23-250 S C movement with date and center sweep second hand, shiny navy blue alligator strap with Nautilus fold-over buckle. Water resistant to 60 meters. 32mm 18K white gold case set with 46 diamonds (~0.73 ct.), charcoal grey dial with gold applied hour markers with luminescent coating, quartz caliber E 23-250 S C movement with date and center sweep second hand, shiny mink grey strap with Nautilus fold-over buckle. Water resistant to 60 meters.